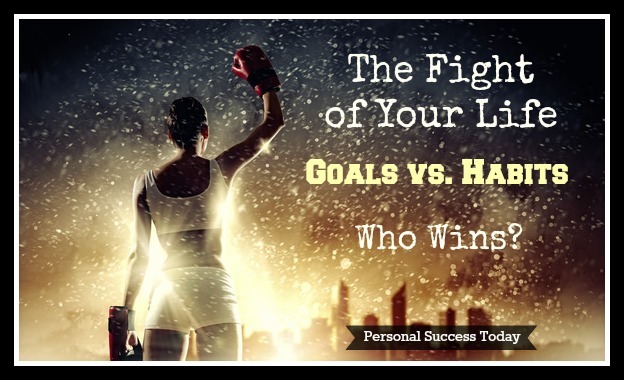 The Fight of Your Life: Goals vs. Habits. And the Winner Is? The New Year is going to be different. You’ve set a Goal to make a change. Nothing can stop you. You’ve set your intention, planned out your moves, and set a time limit. Every year, millions of people around the world make a resolution to change. Many commit these resolutions to paper. They are written down, planned out, and waiting to be executed. The minute the New Year rolls around; they will take action. Unfortunately, within days or weeks, these goals and resolutions fall by the wayside, defeated, and knocked out. It’s not from lack of trying. The punches were thrown hard, and at first, it looked like an easy win. It’s not from some dumb move. Many of these goals were S.M.A.R.T. But the fight was won by the opposition through a steady and determined battle. Each time the goal missed its mark, the habit took a little. An extra punch here, an extra punch there. The habit had one thing the goal didn’t have… stamina. The habit had patience on its side. It wasn’t a brash up-and-comer. No, it was a tried and true entrenched fighter. Street smart. Prepared. The goal of savings beaten by the habit of impulse shopping. Fighters being decimated all around. But once in a while, someone comes out victorious. Someone wins the fight, the battle, and the championship. They have a simple boxing secret that very few people know about. They know that a head on battle with an entrenched habit usually loses. They have learned how to be victorious by watching their opponent carefully. They have discovered how to beat a habit by cleverly using a habit’s strength to win. In the fight of your life series, you’ll learn this secret and how you can easily implement it to help you win your next fight, your next battle, and your overall war. You’ll find a way to be victorious.